The MWSN is currently running a campaign to have workers in the Seasonal Agricultural Worker Program (SAWP) included in the provincial health care plan. As taxpaying residents of Manitoba, they deserve to have the same access to critical health care services as everyone else, and by keeping them outside of the existing public health plan, we expose the people who grow our food to the risk and uncertainty of uninsured medical bills. We want to convince the provincial government of Manitoba to include SAWP workers in the provincial health care plan, something they have already done with international students in this province. 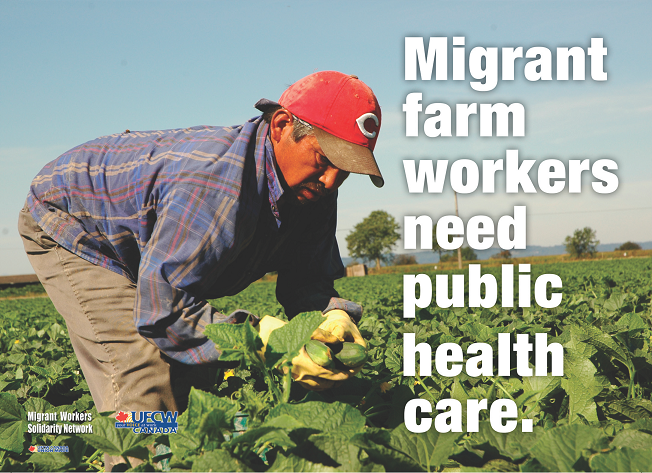 If you support the right of migrant farmworkers to health care, please contact us at info@mwsn.ca to request post cards, or print and sign one yourself (remember that mail to the Premier does require postage).